White House National Economic Council Director Larry Kudlow speaks to reporters at the White House in Washington, Thursday, Feb. 7, 2019. On the day the Trump administration released its fiscal 2020 budget, White House economic adviser Larry Kudlow misleadingly claimed that “overall revenues are up about 10 percent.” In fact, federal revenues are down since the Republican tax cuts became law. Federal revenues were down slightly in calendar year 2018, the first full year under the Tax Cuts and Jobs Act, compared with the previous year, according to Treasury Department data. Federal receipts also were down slightly in the first five months of fiscal year 2019 compared with the same period a year ago, according to the Congressional Budget Office. 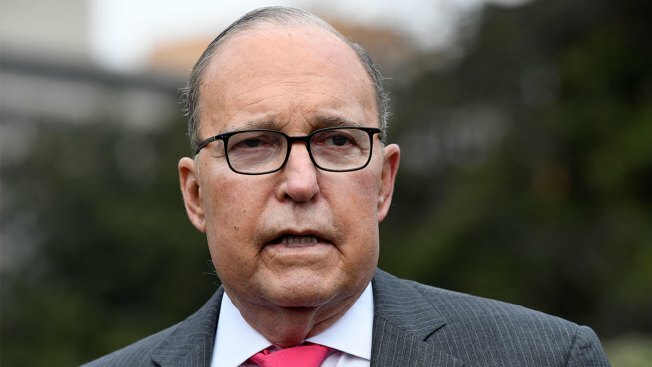 Kudlow, director of the National Economic Council, discussed federal revenue during a March 11 interview with Judy Woodruff, the host of PBS’ “NewsHour.” Earlier that day, the White House released its fiscal 2020 budget — which assumes stronger economic growth in 2019 than economic experts have estimated. The White House budget expects real gross domestic product growth (which is adjusted for inflation) will be 3.2 percent in 2019 — nearly a full percentage point higher than the most recent median forecast of the Federal Reserve Board members and Federal Reserve Bank presidents. In a statement released Dec. 19, the Fed projected 2.3 percent growth in 2019. Questioned about the budget’s rosy economic assumptions, Kudlow credited the Tax Cuts and Jobs Act, which President Donald Trump signed into law on Dec. 22, 2017, with strong economic growth in 2018 that he said will continue this year and beyond. Woodruff, March 11: Well, you are hanging a lot of this on these tax cuts. But we now have a number of experts who are watching those tax receipt numbers that come in regularly. And they are saying that they do not add up to what is anything like the kind of growth that the administration had projected off these tax cuts. Kudlow: Well, actually, overall revenues are up about 10 percent. So that’s a pretty good number. We asked the White House how Kudlow arrived at a 10 percent increase in federal revenues, but we did not get a response. We suspect, however, that Kudlow is cherry-picking one month of data, ignoring the longer-term trend that shows revenues have slightly declined since the tax cuts took effect in January 2018. First, let’s look at the bigger picture. According to the Treasury Department’s monthly receipts, federal revenues totaled $3.33 trillion in calendar year 2018 — the first full year since the tax cuts became law – down slightly from $3.34 trillion in the previous calendar year. The trend can also be seen in this fiscal year, which began Oct. 1, 2018. Receipts totaled $1.28 trillion during the first five months of fiscal year 2019 — “$4 billion less than during the same period last year,” according to the CBO’s monthly budget review for February released last week. But Alexander Arnon, a senior analyst at the nonpartisan Penn Wharton Budget Model, cautioned against putting too much stock in one month of revenue data — particularly February. “There’s a lot of noise in month-to-month receipts so we don’t put much weight on any of these movements, especially since relatively little is collected in February compared with other months anyway,” Arnon, who previously worked at the CBO, told us in an email. It is true that February is generally a slow month for revenues. The $155.6 billion in February 2018 was the smallest monthly amount that year — down $16 billion from February 2017, which was also the smallest that year at $171.7 billion. Not surprisingly, the federal government’s biggest month for revenue collections last year was April, when Uncle Sam took in $510.4 billion during the height of tax-filing season. The Committee for a Responsible Federal Budget also warned about cherry-picking one month of revenue data. It is also worth noting that revenues are falling as a percentage of GDP. In its summary of fiscal year 2018, which ended Sept. 30, CBO noted that revenues fell from 17.2 percent of GDP in 2017 to 16.4 percent in 2018 — “dropping below the average (17.4 percent) for the past 50 years.” The 16.4 percent was also the lowest since fiscal year 2012, according to CBO’s historical data. The federal deficit in FY 2018 was $779 billion — a nearly 17 percent increase from FY 2017. According to the CBO, the Tax Cuts and Jobs Act was responsible for about $164 billion of the 2018 deficit. Of course, we don’t know what the future holds. But we can say that federal revenues since the tax cut law went into effect are down slightly, and to claim otherwise is misleading, if not outright inaccurate.